And did we mention his name is Thunder? Sometimes you jump the shark and sometimes the shark jumps you. In this case, it may be both. We're pretty impressed with Thunder Levin, writer of the cringe-worthy-but-kind-of-amazing viral sensation Sharknado, as well as its forthcoming follow-up, Sharknado 2: The Second One, set to air on SyFy at the end of the month. Contrary to what you may believe based on his film dialogue, Levin is well spoken, witty and doesn't take himself, his films or his newfound fame too seriously. Also, as it turns out, he's on the sharks' side. Hi! Thanks for taking the time to talk with us. 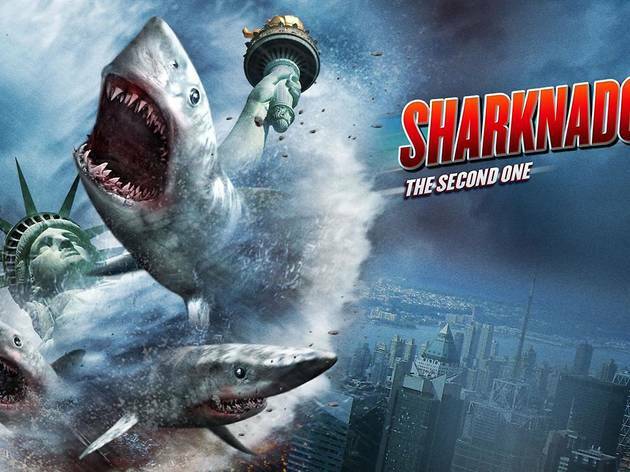 Tell us about Sharknado 2. Just more sharks in more tornadoes? It’s gonna be bigger and better. The first one was such a unique phenomenon, but this time they see us coming. People are anticipating it. I was very pleased that SyFy wanted it set in New York City because it’s my hometown, and the sharknado takes on the character of the city it attacks. So all the elements of city life come into play—taxi cabs, hot dog carts, the Empire State Building and the Statue of Liberty—look out for her in this one. And then there’s the sense of community that we don’t have in LA, where the first film took place. The way the town reacts to the disaster is very different this time around. 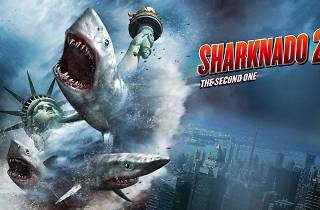 I’m sure the challenge of fighting a sharknado also differs with the vertical density of New York versus the horizontal sprawl of LA. Yes! Vertical density indeed affects weather patterns in New York. Tall buildings create a tunnel effect—if you’ve ever been in the city in winter, the wind howls down the open streets and is a force to be reckoned with. In LA sharknadoes wander about, but in the concrete canyons of New York City they have a better sense of direction, let’s say. ...Is it possible that Ian Ziering’s character could use that to his advantage? It’s possible, but you can never count on a sharknado. There’s no telling what they’re gonna do. Terrifying. What does your biggest fear look like in tornado form? Ooh, that’s interesting. An LA traffic-nado! That would be my worst nightmare. Driving around and around the transition from the 10 East to the 405 North freeways. The transition road that never ends. Mine is just a giant tornado of regret and failure. Oh, I already live in one of those. I’ve been at this for 20 years and have only just achieved a modicum of notoriety. Ha! Well, it’s hopefully about to double, so you’ve got that going for you. Let’s go back to tornadoes with sharks in them: People complained a lot after the first film about the lack of other marine life in the sharknadoes. But it seems pretty clear to me that the sharks just ate everything else up. With the second film we felt we needed to address that issue, so if you look closely we’ve taken those comments into account. But I think you’re right that by and large the sharks did eat up the other marine life, yes. In the first movie, a newscaster mentions global warming as the reason for the initial storm. Later, Ziering’s character says “We can’t just stand here and wait for the sharks to rain down on us!” Did we miss the point of Sharknado as a serious warning about the impact of climate change? Sharknado was absolutely intended as a cautionary tale on the evils of global warming and overfishing. And I’ve been a little disturbed by the fact that people seem to think Ziering is the hero of this movie, when in fact the sharks are simply fighting for their own survival. They’re not evil. They’re defenseless, they’ve been sucked up out of their home and flung about. It’s time we develop some sympathy for these poor displaced creatures. But once you’re potential prey, you’ve gotta fight back! Would you rather fight 100 shark-sized tornados or one tornado-sized shark? As long as I’ve got Ian and Ian’s got a chainsaw, I’m not worried about either of them. So the chainsaw is the definitive sharknado-fighting weapon? What could be better? Think about it—with flamethrowers, you just end up with angry, flaming sharks. Laserbeams maybe…. Oh! The ultimate sharknado-fighting weapon is a lightsaber. But then we’d have to get George Lucas in on the third one. Err, Disney. Never gonna happen. Do you have another weather/animal mashup in the works? We’ve done Sharknado! Anything else would be pointless. Although, Snailnado could be good. Slow-moving, plenty of time for character development. Sounds riveting. Any last words on the sequel? I’m looking forward to seeing the response. Maybe we’ll crash Twitter this time. And I’m not concerned with people who criticize our science or our effects—they've just completely missed the point. The fact that we’re overreaching is part of what makes the films endearing. Our director, Anthony Ferrante, keeps saying that it feels like the script was written by an 11-year-old. What I’m sure he means to say is that it was written by a very talented screenwriter channeling his inner 11-year-old. It’s the kid in me saying “Wouldn’t it be cool if…? !” If we can convey that sense of unabashed joy and fun, we’ll have done our jobs. I think the fans are going to really like it. It’s better to watch with people—and alcohol. I’ve seen people talk online about Sharknado drinking games, but the whole movie pretty much is one. Tune in, poke fun and toss a few back on July 30th at 8pm on SyFy.